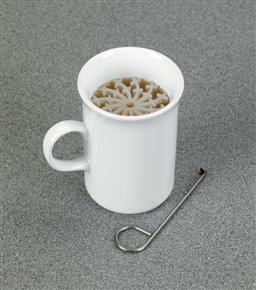 Easy 2 Drink Mug Helps To Prevent Splashes And Spills. Designed to stop the slopping wave action of liquids when the mug is carried or moved, the Easy 2 drink mug has a very clever design indeed. It is an attractive, traditional-looking anti tremor mug but with a difference - it is supplied with the Easy 2 drink insert - a plastic drinking aid that lives inside the cup and helps to prevent splashes, scalds and spills. The insert can be used in temperatures from 0 to 100 degrees Celsius, and can be easily removed and washed in a dishwasher.